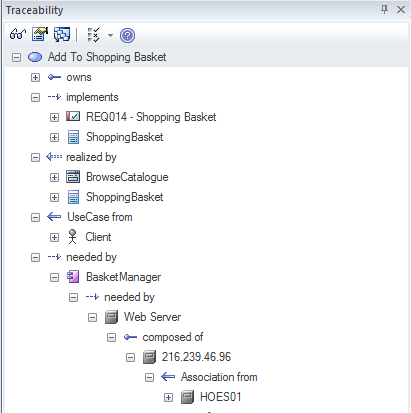 The Traceability window gives the modeler a hierarchical view of element connections, allowing traceability to be visualized and queried as elements are traversed in the model. This tool is particularly powerful because a modeler will often choose to hide diagram relationships but by selecting an element in the diagram and viewing its connections in the traceability window all its relationships will be displayed. 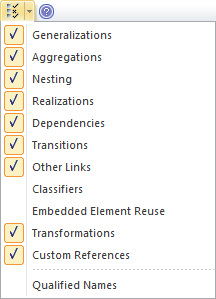 The Traceability Window can be used to view the way an element is connected to other elements in the repository, in a hierarchy including the types of the relationships. This window gives a complete list of all relationships that cannot be seen by viewing elements in the Project Browser and might not appear in any diagrams. It is very useful for managing requirements and tracing how a requirement is related to up-process elements such as Business Drivers and down-process elements such as Components. It is a useful tool for newcomers to a model to gain a quick understanding of which are the important and well connected elements. It should be viewed before deleting an element in the model to ensure that the user understands the element's existing relationships. There are a series of options that restrict the traceability to specified connector types; these can be set to alter what is displayed in the window. The options are available from the toolbar at the top of the window.